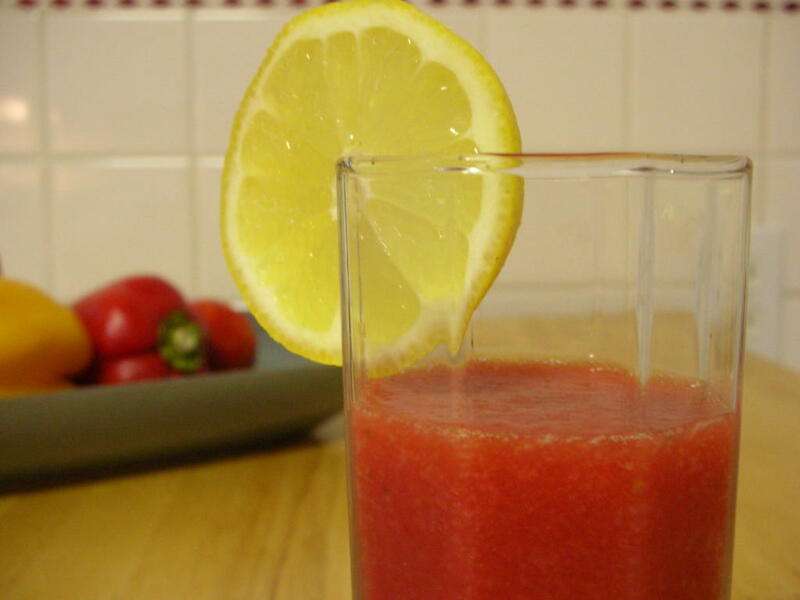 Instead, this tomato cocktail is faintly sweet, almost fruity. It's frothy and refreshing. It's slightly puzzling, an enigma of scent and flavor and texture. If you're working on Five-a-Day in Three-(Meals)-a-Day, this would be lovely at breakfast. Puree all the ingredients in a food processor until very smooth. Here the recipe and I diverged. The Recipe: Pour the mixture into a sieve lined with cheesecloth and placed over a bowl, then bring the cheesecloth over top. Refrigerate overnight to drain. This will produce a "clear" and "pure and refreshing" sort of "chilled consomme" though "better as an alcohol-free apertif" or "palate cleanser" with a "surprising concentration of tomato flavor" and yielding a scant 2 cups. My Version: Pour the mixture into a chinois (that I'm told isn't that but I don't yet know what else to call it), press liquid through the tiny holes into a bowl. Refrigerate the 3 cups of watermelon-colored liquid that comes through, saving what's left behind for, um, I'm not sure what yet. I have the sense that the liquid, with 3 tablespoons of corn syrup, would make an absolutely delicious tomato sorbet.